As we hinted nearly two months ago, Antenna TV will air a Three's Company marathon on Thanksgiving Day! Today they made the official announcement. Come and knock on our door and spend Thanksgiving with Jack, Janet and Chrissy (and Cindy and Terri) as Antenna TV, Tribune Broadcasting's multicast broadcast network, airs a Three's Company marathon. Antenna TV, which airs on 52 affiliates across the U.S. reaching 54% of TV households (plus The Regal Beagle! 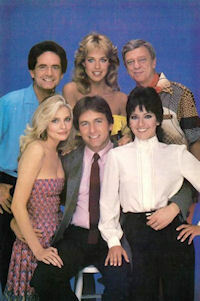 ), will feature 12 hours of Three's Company episodes beginning at 1pm ET on Thanksgiving Thursday, November 24. The marathon will feature twelve classic episodes from 1pm-7pm and will encore as well from 7pm-1am in case you miss any episode on this holiday. Join the trio, Larry and Mr. Furley for non-stop laughs while you enjoy the day with your family with this hilarious comedy that will make you laugh so hard until it hurts! Cook it up on Thanksgiving with Jack Tripper and the Happy Cooker Mr. Furley! No fancy escargot needed! The episodes airing in order are: #67 "The Reverend Steps Out," #70 "The Love Lesson," #73 "Jack's Bad Boy, #75 "The Root of All Evil," #77 "The Good Bye Guy," #79 "Upstairs, Downstairs, Downstairs," #91 "Father of the Bride," #107 "Two Flew Over the Cuckoo's Nest," #110 "Dates of Wrath," #139 "Breaking Up is Hard to Do," #132 "Extra, Extra," and #133 "Jack Gets His." Stay with us for continued updates on Antenna TV. As a reminder, on Christmas Eve and Day, Antenna TV will be airing all of their series that have Christmas episodes ranging from Burns and Allen, All in the Family, Three's Company, The Nanny and many more! We will have more on that with exact timings and more soon, so stay with us! ABC announced late last week that they have picked-up full seasons of rookie comedy Last Man Standing and rookie drama Once Upon a Time, along with sophomore comedy Happy Endings. All three series have done very well in the ratings and will have 22 episodes each this season. These series join Revenge and Suburgatory in getting full seasons. Last Man Standing, starring Tim Allen, has been a self-starter for the network airing Tuesdays at 8pm. After four weeks (and five episodes), the series has averaged over a 3 in 18-49 opposite NCIS and Glee. The series also has mass appeal averaging over 11 million viewers. After just two airings, ABC has picked-up a full season for the highest rated new drama of the season, ABC's Once Upon a Time, from the writers of Lost. This series also is sort of self-starter airing Sundays at 8pm. The series premiered with a 4.0 18-49 rating and in week two it nearly retained all of that by delivering a 3.9 18-49 rating. We have to mention that the New York City, Philadelphia, Boston and Hartford markets weren't even counted in the ratings in week two due to many losing power during the snowstorm, so there was no Nielsen data for this night in those markets, so more than likely it could have built from the premiere. ABC also has given a full season to the buzzworthy comedy Happy Endings. Yeah buoy! The series has flourished in the ratings this season by airing after television's number one comedy, Modern Family, Wednesdays at 9:30pm. The fun and smart comedy had its series high in the ratings for the Halloween episode, which aired after a repeat of Modern Family, so it showed off its legs by hitting a series high on that night. The show just gets funnier and funnier, so don't miss out. And finally, ABC has given a five extra scripts order for the critically acclaimed Pan Am. The drama has been airing Sundays at 10pm and got off to a fast start but has stalled in recent weeks. ABC is still promoting the show and believes in it, so looks like they will be patient. I expect the script order to be turned into episode orders soon. I hope it will be for the full 22, but perhaps 18 is more likely. ABC's sophomore drama Body of Proof, which has a 13 episode order (well 17 counting last season's four episodes that were held for this season), is also in the hunt for additional episodes. Elsewhere, Charlie's Angels was canceled, with two more episodes still to air (one this Thursday and the other is not scheduled yet). The only new ABC fall series yet to hear any news is new comedy Man Up!, which after three airings doesn't look like will get anything more than 13. Stay with us for continued updates.